Merle R. Gordon was appointed by Mayor Frank G. Jackson to serve as the Director of the Cleveland Department of Public Health in June, 2016. She leads a team of over 140 people who serve as stewards of the public health for the residents and visitors of the City of Cleveland. 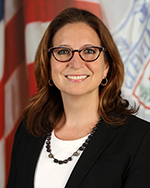 In this capacity, she oversees the divisions responsible for air quality; lead safe living; health promotion, education and communicable disease prevention; the licensure and inspections of restaurants, pools, schools, and solid waste facilities; and addressing concerns about community health issues and code violations. At 27, she was the youngest woman elected to serve on Cleveland City Council representing the neighborhoods of Old Brooklyn and Brooklyn Centre. She chaired the Public Health Committee in her first term, and the Community and Economic Development Committee in her second. Initiatives she lead included prevention efforts related HIV/AIDS, lead poisoning, and homelessness. After stepping down from City Council, she attended the John. F. Kennedy School of Government at Harvard University, where she earned a Master’s Degree in Public Administration. She returned to Cleveland and worked at the Cleveland Clinic as their Public Policy Director, Kaiser Permanente Ohio as their Director of Community Benefit, and HealthSpan as their Director of Government Affairs and Exchange Operations. Director Gordon earned a Bachelor of Arts degree in Economics and Housing Policy from Hampshire College and studied healthcare management at Case Western Reserve University. She is a graduate of Leadership Cleveland and the Rockwood Leadership Institute. She lives in the Shaker Square neighborhood.